Digitalcourage has published a statement in which we criticize the course of surveillance politics currently pursued by the governing CDU/SPD coalition in Saxony. Digitalcourage especially warns about the planned use of covert agents and machine guns, the concept of “abstract danger”, the fact that contacts and companions are affected, and about the planned preventive surveillance of all telecommunication. Update: On Febuary 5th, the Federal Constitutional Court states: „Provisions of the Länder Baden-Württemberg and Hesse on automatic number plate recognition are in part unconstitutional". Appell gegen innere Aufrüstung – jetzt unterzeichnen! IuRe, together with representatives from the Czech Pirate Party, has announced they will consult on the matter with their Minister of Foreign Affairs, Tomáš Petříček. “From the point of view of Czech citizens, we perceive the plans for camera systems along the border and 30 km into Germany as a threat. (…) Even if the stated goal is to fight cross-border crime, we should not overlook the fact that it is a major violation of the rights of everyone who crosses the border,” says IuRe lawyer Jan Vobořil in a press release (translation by Digitalcourage). 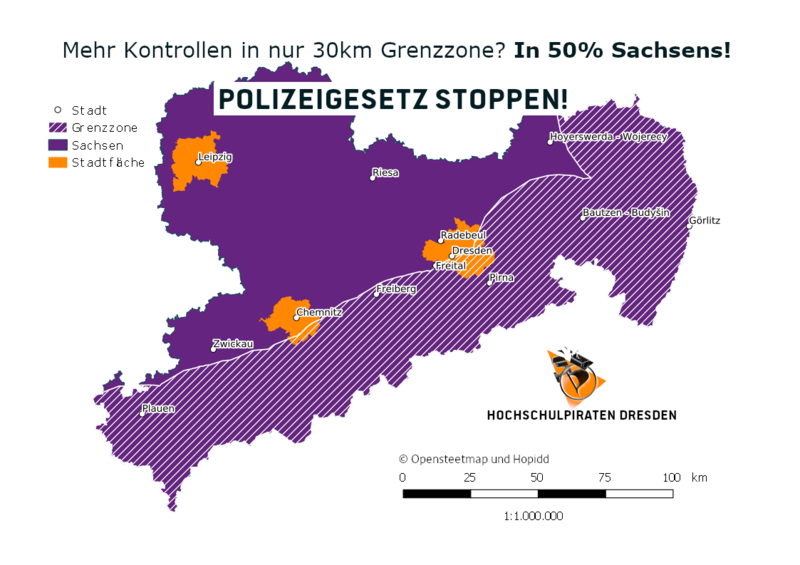 The intensive surveillance area is intended to cover 30–50% of the entire state of Saxony [update: just over 50% as calculated by the Pirate Party group at the University of Dresden]. More precisely: it includes practically the entire districts of Görlitz, Sächsische Schweiz-Osterzgebirge, Erzgebirgskreis, plus large parts of the Vogtlandkreis and Mittelsachsen districts. The area defined as ‘border region’ stretches into the cities of Dresden and Chemnitz. So far, the Saxon Interior Ministry has not responded to the questions posed by Digitalcourage regarding the planned changes in the Saxon law. To us at Digitalcourage it seems reasonable to assume that no attempts are currently being made to find less intrusive alternatives for the planned monitoring of the border region. Nor is there any sign that the required privacy impact assessment for § 59 of this new police law has been made. Digitalcourage therefore calls for this legislation to be aborted – especially since due diligence has to be given absolute priority in a legislative process that would lead to such grave incursions into people's fundamental rights.